If you read your way through this just for completeness, you're a better person than me! 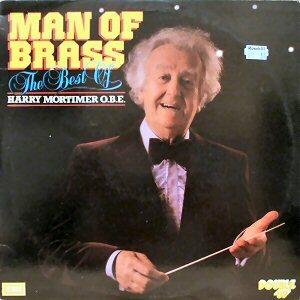 HARRY MORTIMER'S name is synonymous with brass bands. He is the outstanding figure of the brass band world and surely its most devoted servant. Universally known as "the man of brass". His long career as soloist, teacher, adjudicator, administrator and conductor is one of the outstanding chapters in the story of brass band music in our time. They start young in the brass band movement and Harry Mortimer's career began at the tender age of eight when he learned to play the cornet in the Yorkshire town of Hebden Bridge where his father, the redoubtable Fred Mortimer, was the conductor of the local band. He won his first medal at the age of 9 and soon became recognised as something of an infant prodigy on the cornet, collecting, so it is said, some 350 medals and cups before he reached his teens. He was only 14 when he became the conductor of a junior band, leading them to the 3rd prize in a local contest at his first entry into the competition field. When the family moved south to Luton, Harry found himself playing in the Luton Red Cross Band of which his father had just become conductor. As a very small boy he played with them in the national brass band championship and made up for his lack of inches by standing on a ginger beer box! Later he was to become the band's solo cornet. it was at Luton that the young Harry Mortimer, while still a schoolboy, had his first experience of another side of the world of music...playing in the orchestra of the local theatre. In 1924 Harry joined the ranks of Foden's Motor Works Band as solo cornet when his father took over the direction of that already noted band whose name he was to make world famous. He stayed with Foden's until 1942. The opening of "the Mortimer years" at Foden's marked the beginning of a new era in brass band history and technique. It also marked the effective opening of Harry Mortimer's long and distinguished career in the world of music and that of the brass band in particular. What had gone before had been but prelude to his later career and achievements. It was then that he began to gain experience in a wider sphere of music making. For some years he led a "double life" playing in both brass bands and symphony orchestras. He was principal trumpet of the Halle and Royal Liverpool Philharmonic Orchestras from 1930 to 1941, holding a similar position for some years with the B.B.C. Northern Orchestra, and somehow contriving to find time to fill the position of Professor of Trumpet at the Royal Manchester College of Music from 1936 to 1940. Further opportunities presented themselves when, in 1942, he joined the B.B.C. as brass and military band supervisor, a post which he held until his retirement from the B.B.C. some twenty years later. It was a period in which, thanks to Harry's drive and flair, brass and military band music acquired a new significance in broadcasting programmes, coupled with a great increase in the weekly output of band broadcasts. As someone said at the time Harry Mortimer achieved more for the band movement in ten years than others had contrived throughout the history of broadcasting. It was then that he sought to forge links between the world of brass bands and "the musical establishment", attracting the interest of conductors like Sir Malcolm Sargent and Sir Adrian Boult and of composers like Granville Bantock and Sir Arthur Bliss. Some notable original compositions resulted. During those years at the B.B.C. Harry Mortimer began to organise concerts by massed bands, brass orchestras in effect, which were the forerunners of his celebrated "Men O'Brass", securing the interest and co-operation of celebrated conductors amongst them Boult, Sargent and Wood. He also embarked upon a further and brilliantly successful phase of his career at that time as a conductor in the highly competitive sphere of brass band contests. In this he was destined to surpass even his father's remarkable earlier achievement, securing no less than nine victories in the National Band Championship at the Royal Albert Hall and another nine victories in the famous Open British Band Championship at Belle Vue, Manchester. Crowned with success he gave up contesting in 1956 and went off to Australia as Adjudicator of an important series of brass band contests there. Speaking of his decision to retire from the field of brass band contests he once said "it was rather like being a jockey with five horses". He still continued until 1970 as Musical Director of the Fairey Band which he had led to so many successes and continues his direction of the Morris Concert Band which he has now conducted since its inception more than 30 years ago. In the post war years Harry Mortiner (sic) emerged as a national figure, rewarded with the O.B.E. for his services to music and acclaimed for his success as a conductor, in the concert hall, on records or in broadcast brass band programmes and in particular for his direction of that most successful band combination, the "Men O'Brass". Behind the skill and the flair which mark his performances lies the evidence of years of experience, the autumnal flowering of musicianship and of artistic experiences gleaned in during early days in the band room, on the concert platform and at the feet of some of the world's most famous conductors. "I shall never retire," Harry Mortimer once said and today, as he nears his eightieth year, he is still active, conducting, recording, broadcasting; prominent in administrative problems of the brass band world fulfilling a busy round of engagements here or abroad with time in seemingly ineffectual pursuit. Long may he continue. Harry Mortimer's almost legendary reputation as a virtuoso performer upon the cornet rests not simply upon his surpassing technique but also upon the distinctive quality of singing tone which he commanded and the sensitivity and artistry which marked his playing. His influence was widely felt and extended into the playing of a new generation of performers. The quality of his tone excited critical comment, sometimes from critics who made no secret of their lack of interest in the brass band and its music but were quick to recognise the unique quality of tone and expression which he brought to solos and solo passages alike. "Harry does not play, he sings! We hear sometimes of persons making an instrument talk, that is just what Harry does", a critic of much experience asserted. While a respected Northern critic wrote - "Harry Mortimer playing the solo with a beauty and steadiness of tone which most singers might envy" and another performance drew the comment "then there was Mr Harry Mortimer performing incredible feats of agility in "Il Bacio", a coloratura soprano song which no coloratura soprano sings with such smoothness, brilliance or firmness of tone and accuracy of intonation", adding "she may give us one or even two of these qualities but not all four at once!" Harry's playing, captured in all its brilliance and beguiling tone quality on EMI records, is recalled for us in an historical sequence of performances of justly famous cornet solos on the two sides of the first of the two records in this album. If there really are only six cornet solos as someone once facetiously suggested (an opinion calculated to provoke discussion in band room or bar) then the half-dozen indisputable classic solos for the cornet must surely appear amongst the near definitive performance on this record of original pieces or arrangements which every aspiring cornet soloist must command. ALPINE ECHOES by Basil Windsor (pseudonym of Eli Smith, music teacher and a noted figure in band circles in the North) with Harry using his echo cornet adding to the effects of an incredibly taxing but colourful piece. Thomas Lear's brilliant SHYLOCK with its polka rhythm and Percy Code's ZELDA together with one of the earliest of the enduring classics for the cornet in HAILSTORM by William Rimmer, one of the key figures in brass band history and friend and mentor of Harry Mortimer as he was of Harry's father. Its effect upon an audience at the hands of an accomplished performer is easily predictable, the result certain. "What's the encore, Charlie? ", asked a once famous player before rising to perform "Hailstorm". No less irresistible in its seemingly timeless appeal is Arditi's evergreen IL BACIO in Arban's effective arrangement. Another attractive arrangement of a familiar melody is that by Henry Gheel of RICHMOND HILL, one of the earliest recordings in this collection which has, unusually, an accompaniment by a recording studio orchestra. Cornet duets have always featured in brass band programmes and Harry is joined by Jack Mackintosh, a noted contemporary of his early days. in MAC AND MORT which Harry composed for the duo to play, and the well loved THE SWALLOW'S SERENADE. The second side of the record contains two further examples of Harry Mortimer's versatility in the strains of the post horn heard in the course of a Hunting Medley played by Foden's Band and, of more artistic significance, an impressive performance of the solo role in Haydn's TRUMPET CONCERTO in E flat with the Philharmonia Orchestra conducted by the late George Weldon. The record also provides a fascinating reminder of the unique quality of tone, clarity of detail and the wonderful ensemble, rich in individual talent, which characterised the playing of Foden's Band in its heyday under Fred Mortimer. Harry Mortimer's transition from instrumentalist to conductor was possibly less a conscious decision than a gradual and inevitable progress. It began with those 'prentice efforts as a teenager conducting a junior band and continued throughout the years of his brilliant career as a soloist. His services were always in demand by ambitious or struggling bands anxiously seeking specialist training or a "polish" upon their performance of a test piece for some local contest. Further experience came in his role as Bandmaster of Foden's, occasionally deputising for his father. When he finally relinquished the cornet for the baton he was superbly equipped by training and experience for his new role. His unequalled succession of contest successes with famous bands, like Black Dyke, Fairey and others, proclaimed his mastery of the medium. To his undoubted flair as a conductor, his authority and wide musicianship which no doubt owed something to his orchestral experiences, was added that indefinable "star quality" which had always been apparent in his performances as a soloist. His career was soon to take a new course with his promotion and direction of an expanding series of massed band concerts. It arose from his recognition that a wider range of music and higher standards of presentation were necessary if the brass band movement was to meet the challenge presented by the great changes which had come about in public entertainment in the early post war years and in particular the growth of competition from radio and television. His experience in the organisation and direction of performances by massed bands for broadcasting or public concerts in the later years of the war and early post war years, often featuring guest conductors of distinction, convinced him of the possibility as an entertainment medium of such a combination. In 1952 he launched the now celebrated ALL-STAR BRASS some 50 strong with personnel specially chosen from the principal brass bands in this country. It was an immediate success. It was in a effect (sic) a "brass orchestra" of highly talented instrumentalists, intensively rehearsed by Harry Mortimer and utilising a number of specially commissioned arrangements. It was featured in a notable series of EMI records and a taste of the superb quality of the band is provided by their performance of the suite KENILWORTH by Sir Arthur Bliss, one of the classics of brass band literature, recorded in 1960 which appears on side 2 of the second record of this album. Practical considerations precluded an expansion of the concert activities of the ALL-STAR BRASS, and to meet the demand which had arisen from concert promoters and audiences alike Harry Mortimer established the famous MEN O'BRASS with the combined bands of Fairey, Foden's and Morris Motors who, with occasional variations in the combination, achieved a wide popularity on the concert platform and on records in the years that followed their inaugural appearance in 1953. A representative selection of recordings made by MEN O'BRASS and other massed band combinations directed by Harry Mortimer featured in the second record provides an impressive demonstration of the unsurpassable brilliance of the playing and the wide range of sonorities lavished upon music stirring, solemn or beguiling, from the OPENING FANFARE by George Hespe which Men O'Brass, adopted as their signature tune for recording and broadcasting, to the crescendo of excitement provided by the GALOP & FINALE from the WILLIAM TELL OVERTURE. Amongst the wide range of music featured is arresting sound of BLAZON with Gilbert Vinter's highly original writing for brass in this musical evocation of the sound of Biblical trumpets as prelude to his cantata for brass and voices. Wagner's RIDE OF THE VALKYRIES acquires added power in the arrangement for brass bands, and the precision and phrasing which marks the performance of Rossini's BARBER OF SEVILLE OVERTURE is contrasted by the refinement of tone and expression brought to MacDowell's TO A WIDE ROSE and Grieg's elegiac SPRING, while Bach's JESU JOY OF MAN'S DESIRING in which the bands are joined by the organ splendidly captures the devotional atmosphere of a great Cathedral. A taste of the quality of some of the soloists of the bands is provided by the performance by PHILIP McCANN, then with the Fairey Band of the well known solo JENNY WREN and that by GWYN DAVIES of the Morris Band of the popular "THE SHEPHERD'S SONG". This unique compilation of EMI recordings will provide a lasting reminder of the achievements of Harry Mortimer as the outstanding cornet and trumpet soloist of his generation and pre-eminent conductor of some of the famous bands with which he has been associated during his long and distinguished career of service to music and the brass band movement. Harry Mortimer On Brass published by Alphabooks, Sherborne, Dorset.